Being an involved party of an auto accident is an overwhelming and frustrating life situation that happens to us when we least expect it to. According to data from 2009, about 100 people were injured in Oklahoma car crashes daily — that’s about one car accident every seven minutes. That number only continued to rise, as in 2013, there were more than 69,000 car accidents in Oklahoma. As much as we like to believe it’ll never happen to us, the harsh reality is that being in an auto accident is more likely to happen to us than we can ever prepare for. We have several legal practice areas at The Edwards Law Firm in Tulsa, Oklahoma, including in auto accident law. Our auto accident attorneys aggressively seek justice for our clients who have been injured in auto accidents at no fault of their own. Our auto accident attorneys have decades of experience, and we’ve won more than $100,000,000 in compensation for our clients over the years. Call us today to get help for your auto accident case. 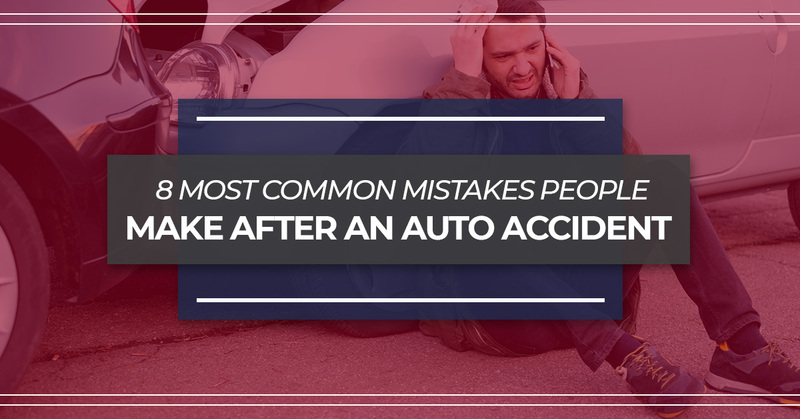 In this blog post, we’ll go over 8 of the most common mistakes people make after they’ve been an auto accident. Keep these topics in mind if you ever find yourself in the unfortunate situation of an auto accident in the state of Oklahoma. 1. Not getting the proper authorities or law enforcement involved. Panic is a natural reaction most individuals feel after they’ve been involved in an auto accident, and sometimes, this feeling can lead them into not reporting the accident to the proper authorities or to local law enforcement. We advise that if you’ve been involved in an auto accident, you should immediately call the police in order to make a formal report. Also, ensure that all parties involved in the auto accident stay at the scene — simply gathering insurance information won’t make the cut. Immediately take note of any injuries or property damage and make sure to include this in the formal report you make with the authorities. It can be a natural reaction to admit fault to an auto accident, even if the fault doesn’t lie on you. Even simply saying something as simple as “I’m sorry” can be seen as admitting fault in court, so try to stray away from this if you are ever involved in an auto accident. Never admit any fault for the accident until the definite cause is determined by authorities. 3. Verbalizing that you or other individuals in your vehicle are “OK” at the scene. It can be an intuitive reaction to want to calm down other involved parties in the auto accident by assuring that you and the other individuals in your vehicle are “OK,” but for legal reasons, we advise avoiding these words at the scene. You might not actually be “OK,” and will need to seek compensation for injuries later down the road with the help of an auto accident attorney. Immediately inform the other parties involved of your injuries and symptoms, no matter how minuscule you might think they are. You can always opt to remain silent as well. 4. Not getting the proper medical attention. It can be easy to overlook any injuries you get from an auto accident, especially if they are minimal or you aren’t quite feeling the full effect of them yet because of an adrenaline rush. You should immediately seek medical attention after an auto accident, as this will provide evidence of documentation for any injuries if you were to go to court. Take photos of any bruises, cuts or other injuries you get from an auto accident if you aren’t taken from the scene in an emergency vehicle. 5. Forgetting to collect any evidence from the scene. Don’t just leave the scene of the auto accident without any evidence, which is a common mistake people make since they are usually in shock. Take pictures on your phone and get the names and contact information of the parties involved as well as nearby witnesses. This will help your case later down the road with the help of an auto accident attorney. 6. Lying about what actually happened. We know that auto accidents happen so quickly it can honestly be difficult to remember what happened and when it happened in detail, especially if your body is going through shock. 7. Agreeing to a quick settlement. We’re not going to lie — it can seem appealing to settle quickly in an auto accident case to avoid any headaches or awkward encounters. But the second you settle, you can’t reopen your case, leaving you entirely responsible for your injuries related to the accident that may arise later in your life. Don’t settle quickly — hire an auto accident attorney that will get you every dime you are entitled to for your suffering, now and later. 8. Not hiring an auto accident attorney for your case. On average, those who hire an auto accident attorney are more likely to receive nearly 4 times as much for their compensations compared to those who do not. An auto accident attorney is trained to help you navigate the legal process and to protect you from the other parties involved in the auto accident and insurance companies. When you’re involved in something as traumatic as an auto accident, you shouldn’t have to deal with the messy aftermath alone. Our auto accident attorneys in Tulsa at The Edwards Law Firm believe in standing up for the people that cannot do so themselves in the legal world, which is why we offer free case evaluations for our clients. You shouldn’t feel intimidated to reach out for help due to solely financial reasons. For more information about our auto accident attorneys or other legal practice areas of ours, reach out to our team today. You can contact us at (918) 221-0516 or at our toll-free number at (888) 600-9836. You can also fill out our online form at your earliest convenience. Need several more reasons as to why you should invest into an auto accident attorney after you’ve been involved in a car crash? Check out our other blog post on why you should hire an auto accident attorney here.